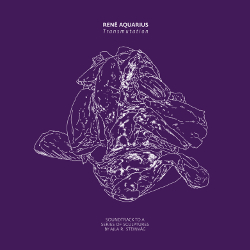 Transmutation is the first solo album for René Aquarius (DNMF) for Moving Furniture Records, after Blight (Utech Records, 2016). For this album again he works with percussion to create dark and minimal electro-acoustic music. Transmutation is the soundtrack to a series of sculptures by Ajla R. Steinvåg. A conversation in 2016 between musician René Aquarius (NL) and artist Ajla R. Steinvåg (NO) acted as a catalyst for an intense collaboration in which the medical and the artistic worldfused. Both artists have a medical background: Aquarius as a medical scientist, with a focus on bone and blood vessel pathology, and Steinvåg as a casualty special make-up artist and actor. Inspiration for both the sculptures and the compositions is the process of metal particle accumulation in the human body. This process can drive cells to activate inflammatory pathways, programmed cell death and subsequent encapsulation of dead tissue. The sculptures and soundtrack together form a multi-media installation, which will presented for the first time in September at the Temporary Art Centre in Eindhoven, The Netherlands.